The War of the Lance is long over. The seasons come and go. The pendulum of the world swings. Now it is summer. 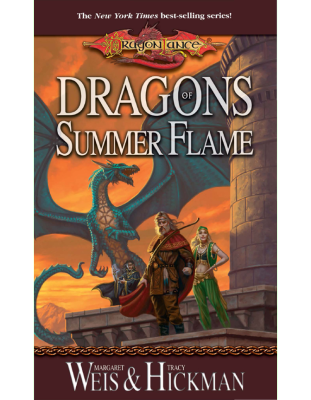 A hot parched summer such as no one on Krynn has ever known before. The uneasy balance begins to shift. The Dark Queen has found new champions. Devoted followers, loyal to the death, the Knights of Takhisis follow the Vision to victory. A dark paladin, Steel Brightblade, rides to attach the High Clerist’s Tower, the fortress his father died defending. On a small island, the mysterious Irda capture an ancient artifact and use it to ensure their own safety. Usha, child of the Irda, arrives in Palanthas claiming that she is Raistlin’s daughter. The summer will be deadly. Perhaps it will be the last summer Ansalon will ever know. Searing flames consume the dry grass. Chaos, father of the gods, returns. New from TSR . . . the book that completes the cycle of the best-selling trilogy that started it all! 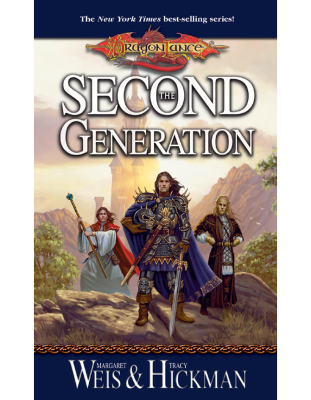 Many years ago, Margaret Weis and Tracy Hickman began spinning out the cycle of the War of the Lance, beginning with a cluster of hearthmates and long-time friends at the Inn of the Last Home. Where that journey would take the two new authors, let alone the characters they introduced to the reading world, could not have been guessed by even the most visionary seer. The War of the Lance lasted long—through two trilogies, numerous novellas, and a hardcover novel, all of which Margaret and Tracy wrote, in addition to the literally hundreds of other works that their guiding force helped to shape. The hearthmates that had begun the story of Ansalon became the Heroes of the Lance, and Margaret and Tracy became authorial superstars. Now they return to Ansalon to finish the cycle of seasons begun with Dragons of Autumn Twilight, Dragons of Winter Night, and Dragons of Spring Dawning. They have come to bring summer to the circle, and with it an end . . . and a beginning.